The 2017 Best of Las Vegas, invites, engages and allows our audience to recognize the best in businesses, things to do, places to go, people who entertain us and the people who make it happen. Clark and Nye counties are the primary area that the Best of Las Vegas program covers. Best of Las Vegas is all about you. The places where you eat, shop, play and relax … the people that entertain you … the people who have made an impact on our great city! Nominate your favorite businesses, people and places in over 290 categories. Once the nominees are tabulated, you may vote for your favorite in each category. Nomination surveys are anonymous and do not require registration. However, we do offer you the opportunity to share your name, email and telephone number with us so that we can keep you up to date on the program. You may submit your nominees in any given category and return to continue nominating others until the deadline. Registration may be necessary in the voting phase of the Las Vegas Review-Journal’s Best of Las Vegas to promote fair voting. You may be asked for your name and e-mail address. Can I Vote By Paper or In Person? No. All nominations and voting are done through our website and links to our voting platform. We rely on our audience to supply us with the names of outstanding people, businesses and establishments in each of the over 290 categories. Once the nominees are finalized, our audience is asked to vote on one choice in each category. Per our guidelines, you are allowed to nominate/vote once every 24 hours. Readers nominate their favorites in Clark & Nye counties, by selecting one of 10 topic areas (Community, Eat & Drink, Entertainment, Health & Beauty, Home & Garden, Hotels & Casinos, Professional Services, Schools, Shopping and Things to Do). Nominations outside of Clark & Nye counties will not qualify for the balloting, but are welcome to participate as advertisers in print and our digital destination, bestoflasvegas.com. Nominating is as simple as entering a name and city in text entry fields. It’s best, but not required, to provide additional information on the nominee so that we can verify them (Phone number, address, URL). Users are not required to nominate in all categories. You may return any time before 11:50 PM Pacific Time, Sunday, August 6, 2017 to add nominations. Users are permitted to nominate a single business in more than one category. Businesses with multiple locations will appear as a single nomination for the voting phase. Only organizations and activities that are currently in business in Clark or Nye counties will be eligible for nomination. Nomination is required to be on the final ballot. Business associates and advertisers of the Las Vegas Review Journal, Las Vegas Business Press, www.reviewjournal.com, businesspress.vegas, and any other owner affiliated company are not given special treatment. Users are not required to nominate in all categories within a given topic, but must submit the survey by hitting the Submit button at the bottom of the survey page. Users are permitted to nominate a single business in more than one category. The nomination period begins 12:05 AM Pacific Time, Sunday, July 16, 2017, and ends at 11:50PM Pacific Time, Sunday, August 6, 2017. Will Everyone That Is Nominated Be On The Ballot? For a category to qualify for the ballot, there must be a minimum of 5 separate businesses that are competing for votes. If a category is not qualifying, we will make reasonable accommodations to move the nominee to a similar category. Once a category is qualified, we will ballot each individual business that has been nominated. I’ve Been Nominated, What Is Required Of Me? Businesses, organizations or individuals that are nominated by our audience will be placed on our ballot as they are verified. Should a business earn enough votes to be in the top five, they will be required to complete a simple online questionnaire, that includes basic business information including, Name, Location(s), Year Established, Business Hours, Phone Number, Web Address (if any) and submit or make available a photo of the business, organization or individual. There is no cost or obligation to participate. This year we are putting more information about our winners in our publication and online. Nominations and Votes are tabulated by a third-party. 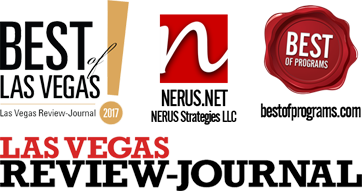 The Las Vegas Review-Journal and the Las Vegas Business Press do not know the results of the contest until announced to the public. In each category, readers vote on their favorite nominee. Readers are permitted to vote in each category once per day. Businesses, institutions, individuals and schools are encouraged to promote the contest in order to gain nominations and/or votes. Competitive advertising, special offers, campaigns are permitted; however, the Las Vegas Review-Journal, at it’s sole discretion, reserves the right to exclude from the competition any businesses or individuals that engage in activities intened to “rig” or “fix” the voting process. Votes that are suspect may be disqualified in the count. The regular voting period begins at 12:05AM Pacific Time, Tuesday, August 22, 2017 and ends at 11:50AM Pacific Time, Tuesday, September 12, 2017. Can I “Write-In” A Business During Voting? No. All nominations have to be verified prior to being placed on the final ballot. During the nomination process, we welcome all submissions. The names of the winners and runners-up will be posted at BestOfLasVegas.com on Sunday, November 5, 2017. All winners will be honored in our Best of Las Vegas special section publishing in the Las Vegas Review-Journal on Sunday, November 5, 2017. In the event of a tie in any category, more than one winner or runner-up may be awarded. Questions about Best of Las Vegas can be directed to rules@bestoflasvegas.com. These are the complete Official Rules. Best Of Las Vegas is produced each year by the Las Vegas-Review Journal. This year’s digital experience is powered by BestOfPrograms.com. Content ©2017 Las Vegas Revenue-Journal. Technology ©2017 BestOfPrograms.com, part of NERUS Strategies LLC. Questions about nominations or entry challenges, please contact support@bestoflasvegas.com. Questions about rules and the awards, please contact rules@bestoflasvegas.com.